I am a man with Cerebral Palsy from birth. This book of poetry is about my relationship with God. Through my struggles in my life, God has taught and is still teaching me how to be thankful each day. No matter how much I struggle, God is always at my side. 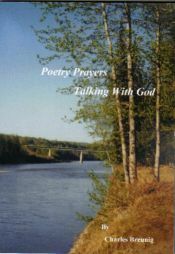 Poetry Prayers Talking With God is filled with poems asking God to help you with your daily struggles. Each poem is a prayer. When you come across a poetry prayer about my condition, just replace it with your condition. God does answer our prayers, sometimes the answer was not the right answer, which we were looking for. But, if we truly believe that God knows what is best for us, we are able to find peace in His answers. And God! Chuck’s deep faith in a loving God has been central to his life. With his book of Poetry Prayers, Chuck shares what his relationship with God has meant, and how God has been there for him during times of struggle and moments of Grace. Chuck’s friendship has been a real blessing in my life. May his book of Poetry Prayers be a blessing in yours.